on April 17, 2019 from 5 to 7 p.m. 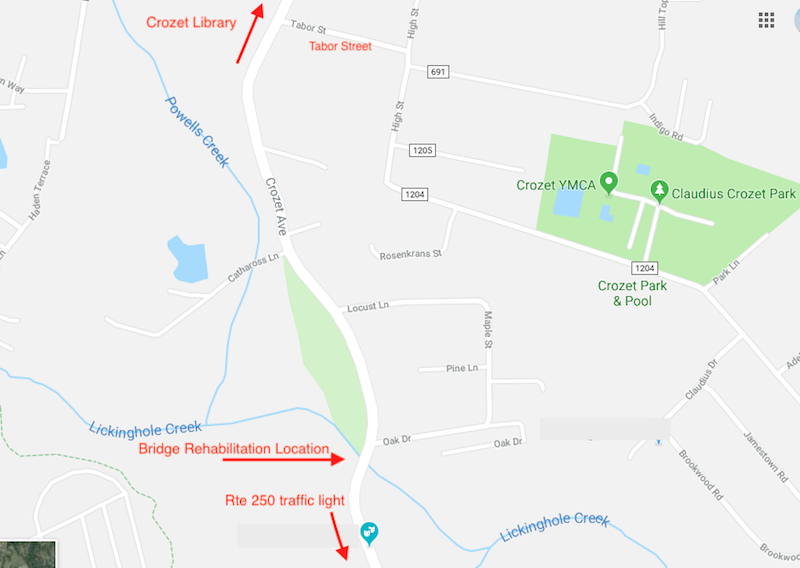 The Virginia Department of Transportation invites the public to attend an upcoming design public hearing on the proposed rehabilitation of the Route 240 (Crozet Avenue) bridge over Lickinghole Creek in Albemarle County. The hearing is scheduled for Wednesday, April 17 from 5 to 7 p.m. at the Crozet Library, 2020 Library Avenue, Crozet. At the open house-style hearing, VDOT staff will be available to discuss the project and answer questions. The public can review project plans, ask questions and obtain information about the project’s timeline, cost and travel impacts, as well as provide feedback on the project orally or in writing. The first alternative proposes to close Route 240 in both directions for six months with a detour in place. Traffic south of the bridge would use Route 250 (Rockfish Gap Turnpike) to Route 240 (Three Notched Road) to reach Crozet Avenue. Traffic north of the bridge will reverse the detour and use Three Notched Road to Rockfish Gap Turnpike. The second alternative involves a phased approach to construction. The bridge would be reduced to one lane and two-way traffic would be controlled by temporary traffic signals for at least eight months. Motorists would experience delays near the bridge site especially during rush hour with this alternative. Written comments can also be submitted by mail to Howard Tomlinson, Project Manager, 1601 Orange Road, Culpeper, VA 22701 through April 27. Email comments can be sent to Howard.Tomlinson@vdot.virginia.gov. More information about the projects can be found on VDOT’s website at http://www.virginiadot.org/projects/culpeper/240bridge.asp. 2019 Special Collection Days are Coming! *Pre-registration with CARE Environmental Corp by April 16, 2019 is required to obtain an appointment according to EPA regulations. To register email: John Doffinger (John@careenv.com) OR Jim McKenna (Jim@careenv.com), or call 1-800-494-2273. This special collection is only open to qualifying businesses and commercial establishments and not households. 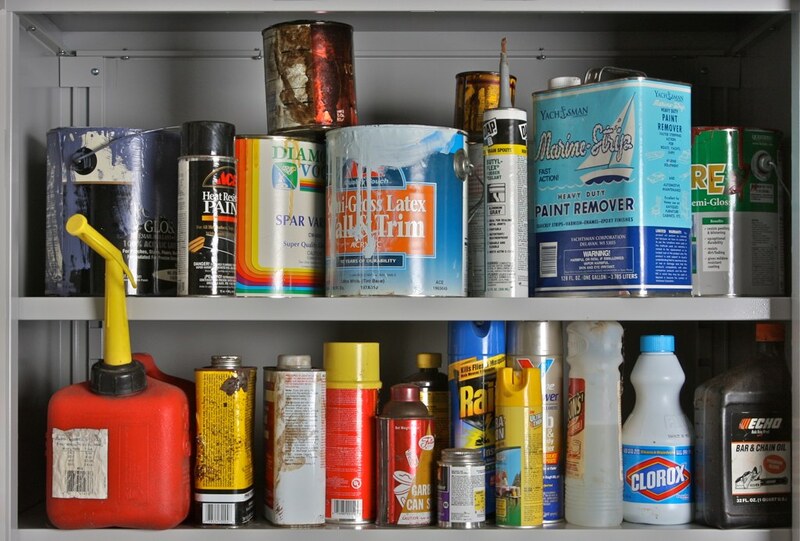 Qualifications are defined by federal law to include businesses that (1) generate no more than 100 kilograms (220 pounds) hazardous waste in a month, (2) generate no more than 1 kilogram (2.2 pounds) acutely hazardous waste in a month, and (3) store not more than 1,000 kilograms (2,200 pounds) hazardous waste. There is a fee associated with disposal. Note: The RWSA normal daily paint collection will NOT be accepted on HHW Days due to logistical limitations. However you don’t have to wait for HHW collection now to dispose of your 1 gallon and 5 gallon latex and oil-based paints in their original containers. This is now a daily service at Ivy MUC.